Located 72 km inland from Malaga, this professional outdoor 1588 metre long and 10 metre wide track boasts 12 right turns and 7 left turns. Since it was launched in 2005, the track has hosted many national and international karting events, Supermotard Championships as well as International and National Pocket Bikes Competitions. In addition to the main track, there is a small 550 m junior tack as well. The are different professional karts available on Circuito Campillos: a kids gokart, a 270 cc, a 390 cc with a maximum speed of 85 km/h. Prices: 7-minute session for kids costs 10 Euros, 9-minute session for adults costs 15 Euros, 15 minutes on a competition track costs 25 minutes and 30 minutes costs 45 euros. The karting track is opened from Monday to Friday from 10 a.m. to 9 p.m. and on weekends from 9 a.m. to 10 p.m. The 970-metre outdoor track is located at the Hipodroma Costa del Sol, only 4,5 km inland off the coastal A7. The Mijas track opened from Monday to Friday (12 a.m. to 20 p.m.) and on weekends ( 10 a.m. to 20 p.m.). There are karts of very good quality available there, up to 270 cc and maximum speed of 70 km/h. There are gokarts both for adults and kids. The minimum age is 10 years old. One 10-minute session costs 20 Euros, however, with a membership, you can get some good discounts on every session you buy. The 450 metre and 200 metre long tracks are located on the roof terrace (second floor) of the Miramar shopping centre, just next to Parque Fluvial and Rio de Fuengirola. Fuengirola’s racing track is opened from Monday to Sunday from 10 a.m. to 10 p.m. There are karts of very good quality available there, up to 160 cc and maximum speed of 50 km/h. There are gokarts both for adults and kids. The minimum age is 5 years old. For kids one 10-minute session costs 10 Euros, for adults the same session costs 15 Euros. There is snack bar and lots of restaurants and bars in the centre including KFC, Subway or Costa Coffee. The Marbella karting track boasts great location. This small track was built at the Funny Beach Club near Marbella – between the Autovia del Mediterraneo and the beach, at the eastern entrance to the city. The karting track is available all year with the exception of July and August. 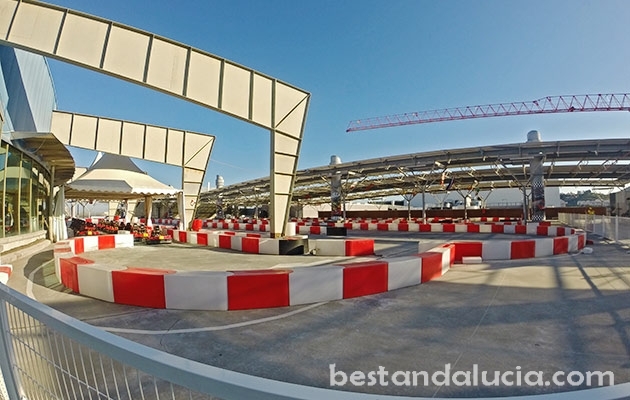 Marbella’s karting track is especially recommended for kids. Eight minute session costs 20 Euros. The price for a karting party for a group of 6-12 people is £387.00. There is snack bar, arcades, watersports and other attractions at the Funny Beach Club. The go-karts are of average quality. The karting track is located on the N-340, at the entrance to Torre del Mar from the west side. The prices for a single adult session is €13, and €6 for children session. The track is opened from Monday to Friday, from 16:00 to 24:00, as well as on weekend from 12:00 to 24:00. There is children track with 120cc go karts and adults track with 160cc go karts. There are other attractions there as well including mini-golf, trampoline, playground as well as bar and restaurant. Kartodromo De Cartaya not far from HuelvaGreat technical and challenging karting outdoor track. 1130 metres long and 9 metres wide. Launched in 1997. Recommended both for the advanced racers and experts. 17 Euros/10 minutes for adults. Racing Dakart in Jerez de la FronteraA complex of two professional tracks in Jerez: a 400-metre indoor track and 200-metre outdoor track. Opening times: Sunday to Thursday- 11:00 to 23:00 and Friday to Saturday – 11:00 to 01:00. 17 Euros/10 minutes for adults (working day). 19 Euros/10 minutes for adults on weekends. Karting Roquetas outdoor track located in Roquetas de MarA 860 metre long, 8-10 metres wide tracj boasting 100 metre long straight. Different models of karts for all ages are available. Depending on the kart, the price for an adult for 7 minutes costs between 12 and 15 Euros and for 20 minutes between 24 and 36 Euros. Karting Copo outdoor track located in El Ejido – AlmeriaA 950 metre long, 10-12 metre wide track with 120 metre long track straight. Different models of karts for all ages are available. Depending on the kart, the price for an adult for 7 minutes costs between 12 and 18 Euros and for 20 minutes between 24 and 30 Euros. For experts there is go-kart with a 2-stroke Yamaha motor with 17 horses available.